Jupiter transit to Libra 2017 prediction for Taurus Sign - Guru peyarchi palangal 2017 for Rishaba Rasi as per Thirukanitha Panchangam. Let us analyze Guru Peyarchi in detail for Rishaba Rasi, so we can know what to expect. The Taurus is the second sign in the Zodiac, as per Vedic astrology. The stars Karthigai (padhams 2, 3 and 4), Rohini and Mrigashiriksha (padhams 1 and 2) come under this Zodiac house. Those born under any of these Nakshatras have their moon sign as Taurus. The Taurus born have a charming face, humorous way of speaking, lover of arts and have a face that attracts everyone. The Taurus sign people are ruled by Lord Venus. Lord Jupiter had transited to the House of Virgo (a friendly House for Lord Jupiter) on August 2, 2016. 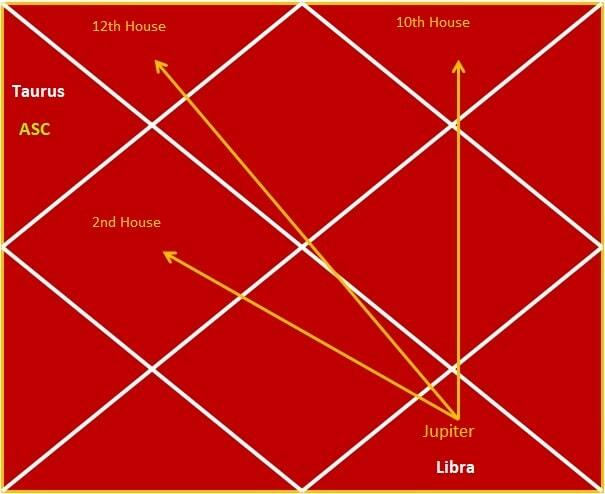 Now, Lord Jupiter will transit to the House of Libra on September 2, 2017, and stay there until October 4, 2018. The last year would have seen you blessed with good luck and profits, as Lord Guru was in your 5th House. Marital relationships mended well and strong. Childless couples were granted their boon. Long standing dues were repaid to you. The Jupiter transit this year will bring in a mix of both good and bad outcomes for you. Lord Guru transits to your 6th House, which is not so good. This is because the 6th House is the House of enemies, cases, conflicts and health disorders. Most of the times, Guru causes mischief when He transits to this House. But, his gaze on the other Houses will strengthen their benefits. Generally speaking, the 6th House is a shadow House, where the strengths of the transiting planets get weakened and result in obstacles. Usually, when Lord Jupiter is in the 6th House, your health, both physical and mental, will be affected. Some might even undergo an operation for health reasons. Your friends turn into enemies. Your financial situation will be rocky, leading to debts. Some might land with court cases. Be careful while driving, as accidents can happen. Marital discord will arise. Some might even go to courts for disputes within the family. Suspicion on your spouse will cause many problems. You must realize that trust and faith are the pillars for a peaceful married life. Do not let your mind run away with mere suspicion, not supported by any fact. So do not let any third party interference between you and your spouse, and try to solve any problem among yourselves. Lord Jupiter, while residing at the House of Libra, looks at the House of Aquarius (your 10th House) with His 5th aspects. He is gazing at your 10th House which is the House of career, business from a shadow House (your 6th House). Hence this will bring in more suffering than happiness. You will perform mediocrely at your job. Misunderstanding and mistakes will occur, sometimes costing you your job. Your work load will be quite heavy. So, your job position will be quite unsatisfactory. Your co-workers will not be supportive. Promotions and salary raise will be fraught with trouble. It is better to ask your own family members to help you out in your business. Some problems in work might land you in legal battles. Lord Jupiter aspects the House of Pisces, which is your 12th House, with His 7th aspects. Usually, the gaze of a planet from a shadow House (your 6th House) will not give much benefit. The 12th House deals with expenditure. Expenses will pile up on you. You must take care to spend your money on good deeds. Instead of loaning out money, you can spend it on your spouse. This will at least ensure happiness in your life. Spend your money on property, house or vehicles instead of speculating about it. Lord Jupiter aspects your 2nd House, the House of Gemini, with His 9th aspects. The 2nd House deals with money and family life. Celebratory occasions transpire in your family. Your family members will be supportive and helpful. You might be spending a lot on academics this year. Students should focus solely on their studies. You should learn to forgo entertainment, wasting time in idle chat with friends. Instead, working hard with a steady concentration will take you closer towards your dreams. Some of you might lose some marks due to ill health. Hence you should be very careful in all matters. People in business and professional jobs will face many troublesome situations. Promotions and salary hikes will be mired in confusion. Some might face court litigation against your company or partners. Marital discord will be seen. Some might have to leave their family to other locations for work reasons. Some couples will separate. Marriages will occur, after facing some hurdles. Similarly, childless couples will conceive after some troubles. Lending or borrowing money will lead to complications. Money inflow will not be satisfactory. Some will be pushed to debt. Forgetfulness will be on the rise. Some will be robbed. It is best to keep to yourself. Do not poke your nose in other’s business. Instead of wasting time in entertainment activities, try to listen to meaningful lectures and read books of culture. This will broaden your mind.